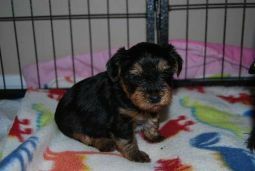 Yorkshire Terrier breeders links and breed information on pups4sale.com.au. 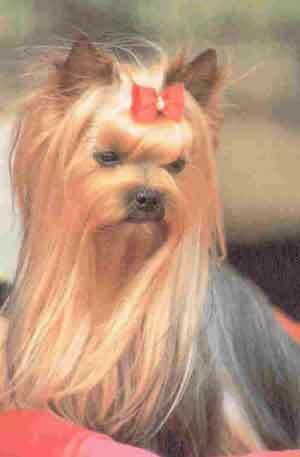 The Yorkshire Terrier is a breed of dog that came into existence back in the early 1800s in England. They are a little breed that was originally bred to be both a lap dog and to catch rats, but now are seen as a great companion dog for people of all ages. Known to some as the Yorkie, this is a spirited breed that, believe it or not, makes an excellent watch dog because of its fearlessness and its loyalties to its owners. It's an all-around great breed that can live in just about any environment if trained correctly. 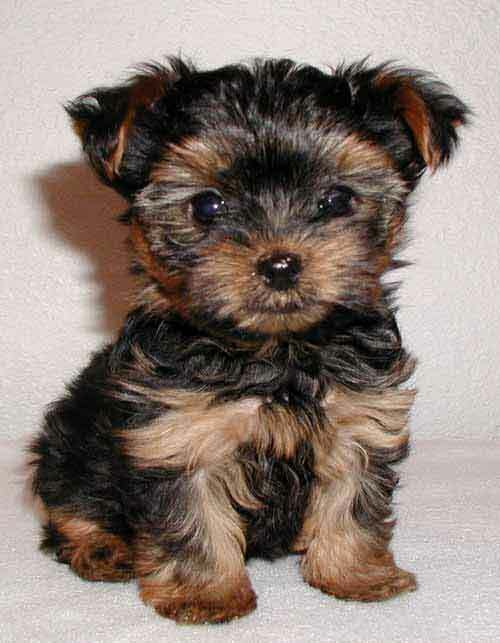 People obviously love their Yorkies because this is now the second-most popular breed in the world. The Yorkie is a very small breed that is known for its distinctive size and hair characteristics. They have a small, almost flat head with a short muzzle and a dark nose. Their eyes are also very dark and a little bit bigger than other dogs of this size. The triangular ears stick straight up on the head, which actually makes sense for this breed because they are very alert. As far as a Yorkie's size goes, they will grow to be about 8 inches tall or little bit shorter and will weigh somewhere around 8 pounds. It is hard to tell the difference between a male and a female based on size because they are all right around the same height and weight.Their hair is like silk, which makes it easy for owners to fashion it in just about any way that they like. It's as smooth as dog hair comes, which is why they are so popular as lap dogs. They have human-like hair, so it is a very popular breed for people who are allergic to dog dander.The coat is always the same color, with their backs and tail being all blue, and their head, chest and paws being all tan. Some owners decide to give their Yorkie different haircuts to help them figure out which is which. Many small breeds realize that they are tinier than other dogs, but that doesn't seem to be the case with Yorkshire Terriers. They are very proud dogs and will stand up to anything, which can make them a bit stubborn when their owners need them to stop barking or to follow a command. Still, this doesn't keep them from being great family dogs because they are very loving and extremely loyal. 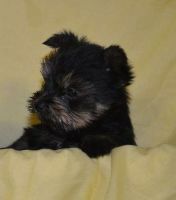 Yorkshire Terrier puppies show off their confident personalities at a very young age. This is why owners need to spend time with them going over potty training and teaching them how to interact with people and other animals.An interesting thing that both puppy Yorkies and adult Yorkies do that other dogs don't is make a unique snorting noise. They do this because air goes quickly up their nose and they have a sort of gag reflex. This is not something that is harmful to the dog, so it's not a bad thing that it usually causes people to laugh at the dogs.Yorkshire Terriers are perfectly fine with children, but parents should always stay close because this is such a tiny breed. It's not uncommon for them to be stepped on by young kids, so it's important that parents teach both the dogs and their children how to play together.Yorkshire Terriers are known for being a bit more aggressive towards dogs and other animals, so no matter how much training they have gotten, owners should be careful when introducing a Yorkie to other animals. They can sometimes be good social animals, but it's more common for them to be uncomfortable around foreign animals. One of the things that makes the Yorkshire Terrier a unique small dog is its great ability to serve as a family or individual’s watch dog. While they don't make the best guard dogs for obvious reasons, their fearlessness will make them attack anyone who they think will cause harm to their owners.Other than needing the occasional potty break, Yorkshire Terriers are usually just fine with being left alone. They actually like being left alone with their toys and their own beds, so it is one of those rare breeds that is okay for single working individuals to own. Of course, they do need their daily attention and exercise, so owners will need to make sure that they aren't left alone for too long. 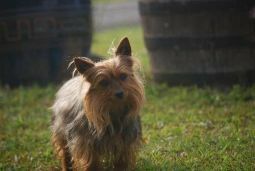 Anyone who has ever met a Yorkshire Terrier knows how stubborn they can be. This stubbornness makes it pretty difficult to train them, but patient owners can have a lot of success training their Yorkies if they know the right way to go about getting them to learn. Most dog professionals recommend having Yorkies train at an early age with other puppies. This not only gets them used to certain training methods, it also gets them used to being around other dogs at a young age. Taking training classes isn't absolutely necessary, but it's certainly not a bad idea for anyone who doesn't have experience training this breed.Praise goes a long way when training a Yorkie. They really like it when their owners are happy with the and they are equally as happy when they are rewarded for doing something correctly. This is a breed that loves to walk ahead of its owners, so training them to go on walks the right way is something that every Yorkie owner should do. One thing that a lot of Yorkie owners assume is that playing small dogs during the day meets their exercise requirements. This is definitely not true. They need a daily walk to keep them in good physical and mental health. These aren't dogs that need a ton of exercise to be happy, though. A walk and a little bit of time playing with their toys every day will keep them satisfied all year round. While Yorkies do not shed because of their human-like hair, they still do need to regularly get their hair cut to keep it from covering their eyes and to keep it from matting.Yorkies should also have their teeth brushed regularly. They have a tendency not to enjoy this process, but they should get used to it if it is done at least once a week. Yorkshire Terriers only need a bath every one or two weeks, but it's okay if they are less frequent as long as the dog is clean and has not been in the woods. Yorkies can live long, healthy lives, with many of them living to see their 15th birthdays. However, this doesn't mean that they aren't prone to some of the most common dog diseases. They have more delicate stomachs than most other dogs, so their diets should consist of foods that are acceptable for the breed. The most common health issues that Yorkies deal with are bronchitis, teeth issues, and herniated disks. These things can be avoided, though, if they are fed correctly and live in a healthy environment. 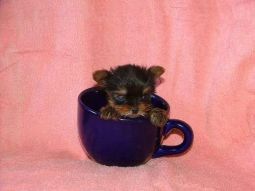 The reason why Yorkies are owned by so many people is because they can live in homes of any size. They are also as happy living with one person as they are with a big family, so there really aren't many limitations for who can and can't own a Yorkie. Even though a Yorkie can live in just about any climate, they do prefer to live in warmer areas because their hair doesn't keep them very warm in the colder months. Someone who lives in an area that has multiple warm months would be ideal for this breed. If there was one thing that potential Yorkshire Terrier owners have to have to be great companions for this breed, it would definitely be patience. They are very tough to train if you don't have experience with stubborn breeds, and they are very independent, which makes it hard for some people to get through to them. Impatient people should not get this breed. Anyone who plans on bring more dogs into the house after a Yorkie is introduced may not be the best match. Yes, Yorkies can learn to get along with other animals, but it is in their nature to always be on guard. Plus, they can get aggressive out of nowhere, so this isn't the best breed to mix in with other dogs. Of course, it's not a problem if they grew up with the other dogs in their lives. 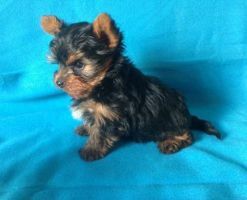 Yorkshire Terriers are a great breed because they have the personality of a big breed, but they come in the tiniest of sizes. They have some of the best personalities of any breed in the world and owners always love a dog that is loyal and affectionate. There aren't too many people who wouldn't like having one of these little pups in their homes, so it's no surprise that their popularity continues to rise.